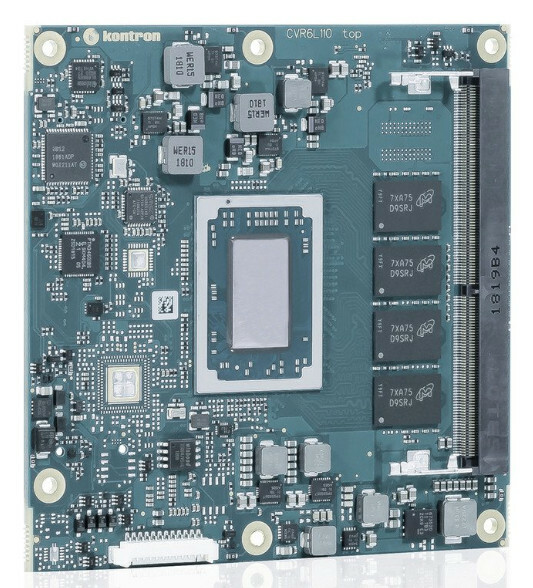 Kontron a global provider of IoT/ Embedded computer Technology (ECT) introduces its Linux friendly “COMe-cVR6” Express Type 6 module, that comes with a Ryzen embedded V1000 SoC with up to 24GB DDR4, including 8GB soldered on board. The board also comes with a quad- display support and optional- 40 to 85-degree Celsius operation and security features. The COM Express compact module’s smaller form factor significantly saves space in comparison to most comparable solutions, allowing developers to create more compact designs with higher performance. Variants of the COMe-cVR6 (E2) are also resistant to vibration and shocks due to the permanently soldered memory, just as all other components, such as voltage smoothing capacitors, and controllers are selected for highest resistance to environmental stresses. The new module is particularly suitable for applications in harsh environments, medical or industrial image processing systems. This product runs Linux or Windows 10. The new COMe-cVR6 adopts the 95x95mm COM Express compact Type 6 form factor. In COM Express Compact modules, external I/Os are placed next to the module instead of attaching them on the underside of the carrier board when using a larger basic form factor. This allows the main board height to be reduced by up to 2cm. The new AMD Ryzen V1000 processor combines the extremely powerful Zen micro processor architecture with the new AMD Radeon Vega graphics supporting up to 11 compute units. The AMD Ryzen Embedded V1000 processor offers up to twice the performance than the previous versions and delivers up to 46% more multi- thread performance than competitive solutions. Other COM Express compact modules with the V1000 SoC includes Seco’s COMe-B75-CT6. V1000 based basic modules include Congatec’s Conga-TR4 and Advantech’s SOM5871.